This morning when Fergal and I were putting away the groceries and there were 3 jars of tahini he said I was a ‘tahini monster’. He has a point. I do love tahini. After mayonnaise, tahini based sauces are my next go-to. So when I spotted the ‘TMT sauce’ in Sarah Wilson’s book ‘Simplicious’. I had to make my own. It’s really good. There’s the creamy nuttiness from the tahini, the salty / savoury umami complexity from the miso and the fresh vaguely ‘curry’ flavour from the turmeric. I’ve mainly used it on veggies like the raw kale pictured above and it’s amazing with my Super Tender Broccoli or with Poached Eggs. I also imagine it would be lovely with chicken fish, or even a juicy steak. It really is that versatile. 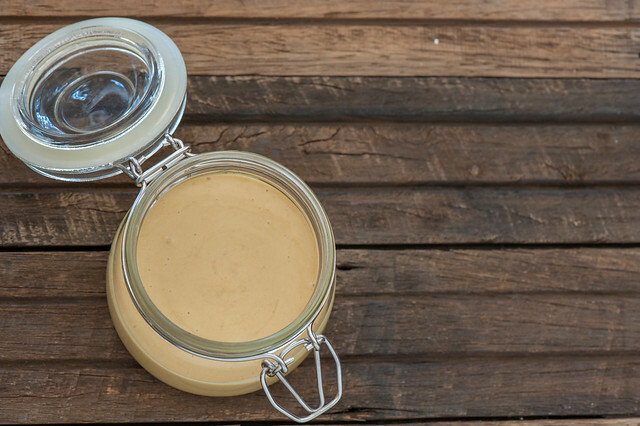 Tahini and miso paste are easily found in most supermarkets in Australia. But if they’re new ingredients to you, they’re both worth tracking down (although if I had to choose between them I use tahini more than miso). They both keep for ages in the pantry. Here are 7 Delicious Ways to Use Miso Paste. Most people start using this sesame seed paste to make Hummus. But it’s also really lovely in my Roast Cauliflower Hummus if you prefer a Lower Carb option. I also love it in this salad dressing, as a sauce for salmon, drizzled over stuffed sweet potatoes, in a stir fry, to jazz up good old ‘avo on toast‘ and in this heavenly Tahini Yoghurt Sauce. And don’t miss 10 Tasty Ideas for Tahini. Are you a miso and / or tahini fan? Are they easy to find in your neck of the woods? Let me know in the comments below. If you like tahini, I can’t recommend this sauce enough. If something were to happen and I couldn’t eat mayo again, this would be my new go-to condiment. Like I said above, it’s really versatile, you won’t have any problems finding uses for it! 1. Place tahini, water, miso and turmeric (if using) in a bottle or blender. Using a stick blender or your regular blender / food processor puree until smooth. You can mix by hand but it’s hard to get the miso completely emulsified so your sauce will be a little lumpy. 2. Taste and season if needed, although I find the miso provides enough salt. Keeps in the fridge for weeks. Will thicken a little over time and if you’re using fresh turmeric the colour will intensify over time too. no miso – replace with soy sauce and decrease the water slightly so the sauce isn’t too runny. This soy version is pretty good but given the choice I’ll take miso every time. garlicky – feel free to add 1-3 cloves garlic. I prefer it without but that’s just me. 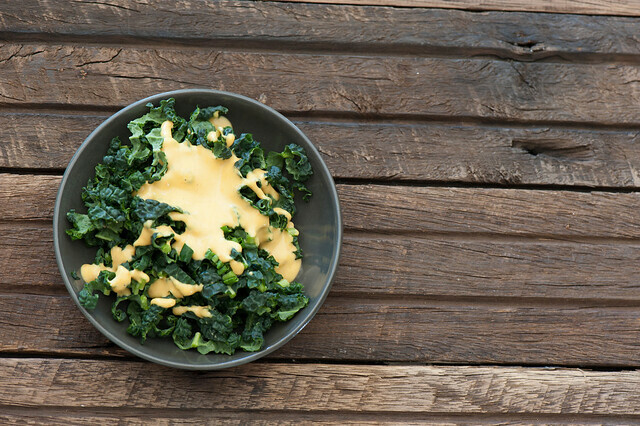 no tahini – try blending the miso and turmeic into your favourite mayonnaise instead. Use 1 cup mayo to replace the tahini and water. lemony – you could add a little lemon juice but I find the turmeric adds enough freshness without needing the extra acid. Yes to Miso + Eggplant Lara! And I use shiro miso. But if using dark you could just use less of it. Maybe I used too much miso (I used dark, 1 tbsp), but I find the miso to be overpowering and can’t taste the tahini at all. Should I expect some flavor from the tahini or is it just to add some consistency to the sauce?